June 2-3 is Free Fun Weekend in Wisconsin, which includes free admission to all Wisconsin State Park System properties. No state park admission stickers or trail passes are required. Many properties take advantage of this weekend to hold special events. Some highlights include Discovery Day at the Pike Lake Unit of the Kettle Moraine, with archery, t-shirt painting, a wildlife show, kayak demos, and more. This event concludes with a grand opening ceremony and dedication of a new outdoor amphitheater featuring live music and guest speakers. On Sunday, Willow River will host Art Along the Willow, featuring more than 40 art and craft vendors, kids activities and concessions. Kohler Andrae and Mirror Lake will host music concerts, and because it is also free fishing weekend, about a dozen fishing clinics and fishing activities will be held across the state, including a live fish aquarium at Peninsula State Park. Make it a free fun "fit" weekend! There's no better time to find a fresh and fun way to wellness. Try stand up paddle boarding for the first time, master a new hiking trail, or break out onto a new bike route. The choice is yours! Flowers are in bloom as yellow and blue flags, false lily-of-the-valley, forget-me-nots and others boldly display their colors. Fronds are opening into ferns as the surroundings seem to get greener by the day. 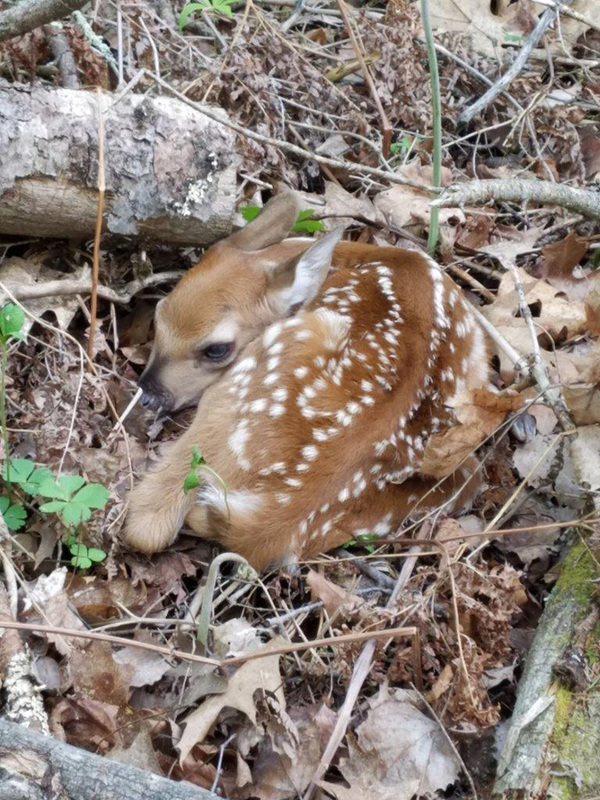 The woods are also full of newborn wildlife as reports are rolling in describing baby birds, turkey poults and numerous fawns. Wildlife are also grazing in the forests and fields and the banks and shores of area waterbodies are playing host to waterfowl. Anglers on the Menominee reported success on walleye, crappie, northern pike and bass, as well as a couple musky. On the Oconto were similar reports, with pike, perch and channel catfish being mentioned by those off the boat launch. In Door County anglers are having consistent luck with bass, with many reporting upwards of 20. In Kewaunee, parties reported hitting limits on coho from the ramp and while they haven't made their way to Manitowoc piers yet, alewife are still around, as is the occasional brown trout. Anglers targeting chinook and coho near Plymouth are still waiting for the bite to improve, while pressure in Port Washington this past weekend was at peak. Daily limits were reached consistently, with rainbow trout, coho and chinook all landed in abundance. A similar story was reported from the McKinley Ramp in Milwaukee County, with numerous limits reached for salmon, although more sporadic success for trout, despite some sightings of small schools of young swimming near the surface. Weather looks to be sunny, with chances of thunderstorms for pieces of the state this weekend, and the temperature has eased off a little bit. All in all, it's looking like an excellent weekend to get out into Wisconsin's outdoors! As we say goodbye to May bird migration is generally winding down as expected. Some straggling warblers will continue to move through over the next week, as will some of the later migrants like both cuckoo species, all the flycatchers, and various arctic-nesting shorebirds. Look for northbound flocks of cedar waxwings and common nighthawks, though spring flights of the latter are always smaller in magnitude than noted in fall. The first dickcissels, another very late migrant, were reported this week, though it's too early to tell if this year will rival the big numbers that infiltrated the state last year. Skywatchers may have noted large numbers of immature broad-winged hawks on the move and this may continue well into mid-June. In addition, "molt migrant" Canada geese were reported moving north in V-formations this week. These are non-breeding and failed-breeding birds headed to the resource-rich wetlands of Canada to molt (replace) their feathers. With migration dwindling, breeding activity continues to increase. 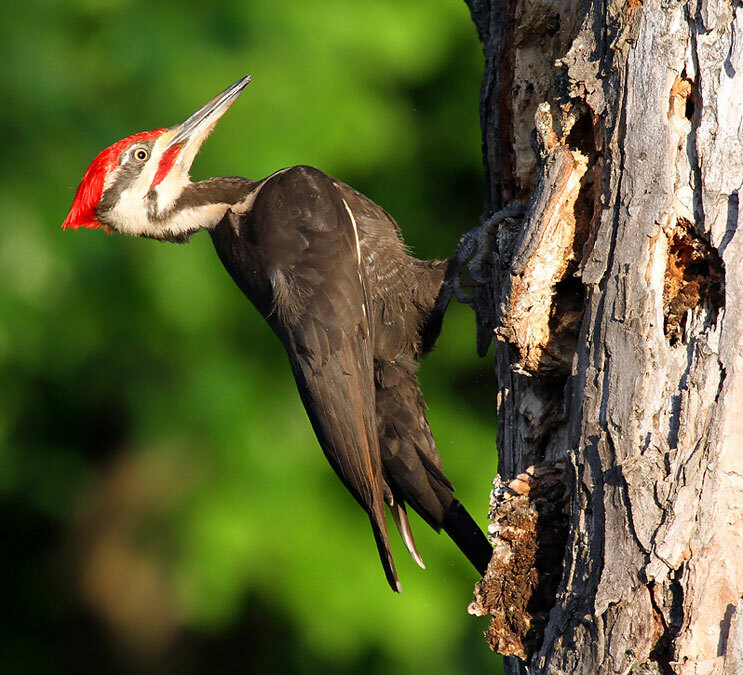 Now is the time to get involved in the Wisconsin Breeding Bird Atlas, a five-year statewide survey to document what species are nesting where. Observations may be reported anywhere in the state and more volunteers are needed, so learn more today! Some of the rare birds spotted this week included Hudsonian godwits at several locations, snowy egret in Fond du Lac County, glossy ibis and several white-faced ibises at Horicon Marsh, lark bunting in Portage, lingering snowy owl in Oconto, and a white-eyed vireo amid an impressive total of 7 Bell's vireos in Sauk. Find out what others are seeing and report your sightings to www.ebird.org/wi. Good birding! Ridgeway Pine Relict Workday: Friday June 8 9 a.m.- noon - Ridgeway features towering cliffs of pine with northern plant species underneath and extensive oak savanna. Help the Friends of Ridgeway Pine Relict, Inc. care for this site by removing invasive plants and planting native plants. Workdays are once a month on the second Friday. We will be removing invasives by mowing, pulling, or spraying. No experience is necessary, you will be trained on site. Bluff Creek Workday: Saturday June 9 9 a.m.-noon - Come see what's blooming and help volunteers during our Southern Kettle Moraine SNA workdays. Enjoy a short hike through the woods to a springs complex, then use sprayers to remove invasives or aspen girdling tools to remove aspen. This work will help promote native seedlings we have planted in the woodland and wetland plant communities. No skills needed you will be trained onsite. Brule River State Forest - Flowers are in bloom! Forget-me-nots, wild strawberries, yellow flags, blue flags, and false lily-of-the-valley are a few of the species that are boldly displaying their flowers. The bright white or colored blooms are easily noticed against the green background of the forest floor and waterways. Other flowers, like wild ginger, are not so apparent unless you take the time to notice and know where to look. The woods are full of new babies, too, in these early days of summer. 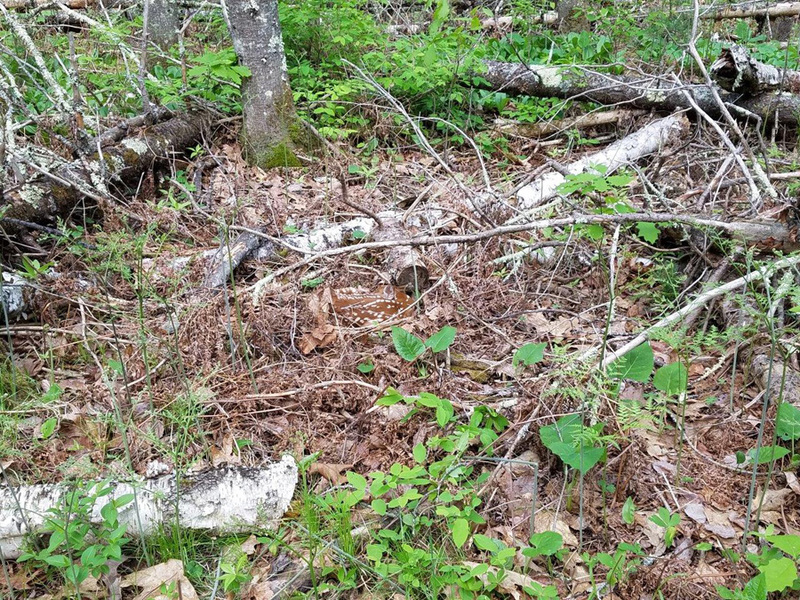 We've been hearing reports of baby robins, turkey poults, goslings, and fawns. Flambeau River State Forest - The Flambeau River State Forest has a plethora of hunter/walking trails and some very beautiful scenic hiking and nature trails. If you choose to go to Lake of the Pines Nature trail or Little Falls/Slough Gundy Scenic Area, there are map containers on the entrance posts of the trails, just grab a map. When hiking Lake of the Pines, you can enter this trail at Lake of the Pines Landing or across from the registration station for the campground. The trail runs along the bluffs on the west bank of Lake of the Pines and into some rolling hills loaded with large white pines and hemlocks. This trail takes you past an ephemeral pond that is filled with croaking and peeping frogs. When hiking Little Falls/Slough Gundy be sure to read the signs carefully, and if you are able to traverse boulders and cross a rocky river bed, try crossing to Slough Gundy. Once across the river bed just follow the path and you will see some large white pines, cedars, hemlocks and also some unusual rock formations. The South and North Fork are at a normal level for this time of year. There has been success fishing for small mouth bass on the river. It's such a joy to have spring here and all the pregnant wildlife and youngsters born daily. Elk cows and deer does are in their third trimester of pregnancy and we are viewing young of the year roadside or working out doing field work. Grazing wildlife is prevalent throughout the forest. Bears are out and about, and the evidence is around the dumpsters. Each waterhole seems to have some waterfowl in it. Robins, wood peckers, finches, indigo buntings, rose breasted grosbeaks, kingfishers, swallows, blue jays, grouse, woodcock, geese and sandhill cranes are just a few of the birds being viewed by area residents and Forest staff. Spring flowers are blooming. Bloodroot, trilliums, wood violets, marsh marigold, trout lilies, bellwort's, spring beauties and leaks and fronds are out, and the fronds are bursting out into ferns. So green, so fresh and new and beautiful. The Flambeau River is such a precious resource. Its banks are thriving with water and animal life. Nesting, playing of furbearers and a haven for ducks and geese. Lake of the Pines Campground is open. Lake of the Pines is a very beautiful rustic, quiet and well-maintained campground. It is located on a bluff overlooking Lake of the Pines. Many of the sites are on the lake side where you can watch the early morning sunrise in the east. It has a very nice nature trail connected to the campgrounds where you can hike and explore the flora and fauna of the area. Lake of the Pines Campground has 6 sites available for first come first serve, the rest of the sites are reserve able. Connors Lake Campground is open for reservations. Connors Lake has 4 reservable electric sites. A number of the sites at Connors Lake Campground are located directly on Connors Lake and are also very well maintained. Both campgrounds offer a wonderful camping experience. If you are interested in reserving sites for 2018, Lake of the Pines Campground and Connors Lake Campground can be reserved by going on www.reserveamerica.com or calling 1-888-947-2757 to register. Both campgrounds are little gems. The weather forecast for the remainder of this week and weekend, according to the National Weather Service, indicates that Friday will be mostly sunny with a high of 70 and low of 49. Saturday, mostly sunny slight chance of t-storms, with a high of 74 and a low of 51. Sunday will be partly sunny, with a high of 71 and a low of 47. It sounds like an awesome weekend for camping. Be safe, and come see us at the Flambeau! Good air quality for Wisconsin on Thursday, April 18, 2019 at 1:45 pm CT.